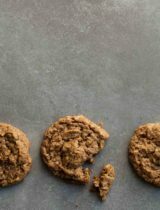 These gluten-free, paleo and vegan coconut cookies are crisp and buttery, light as air and melt-in-your-mouth good. It’s always around the holidays that time seems to accelerate to break neck speed. How is it that Thanksgiving is already behind us when Halloween seems like only yesterday and summer is still fresh in my mind? Nevertheless, I’m looking forward to pulling out the decorations and getting festive before the rest of the season rushes by. But first: cookies. It’s not the holidays without a batch of cookies in the oven, so I have a crispy little coconut cookie for your cookie platter this year. 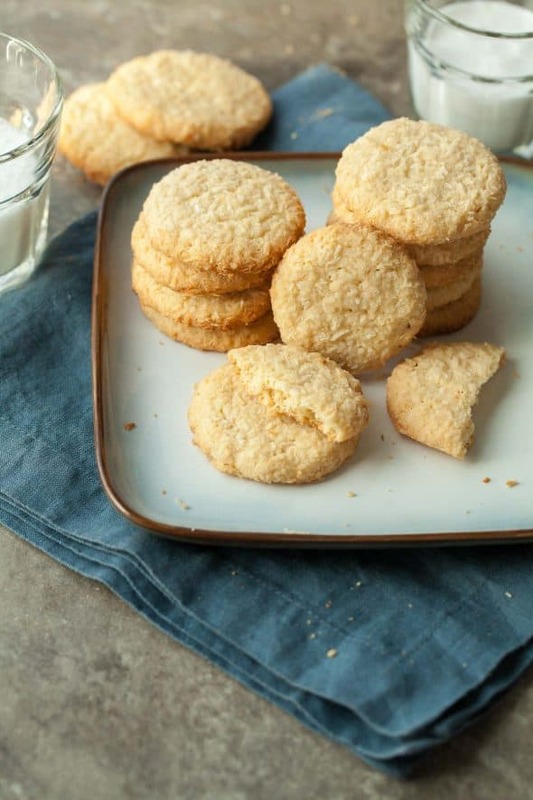 One can never have too many cookie recipes in their repertoire and these crispy little cookies are so light and buttery and full of coconut goodness. 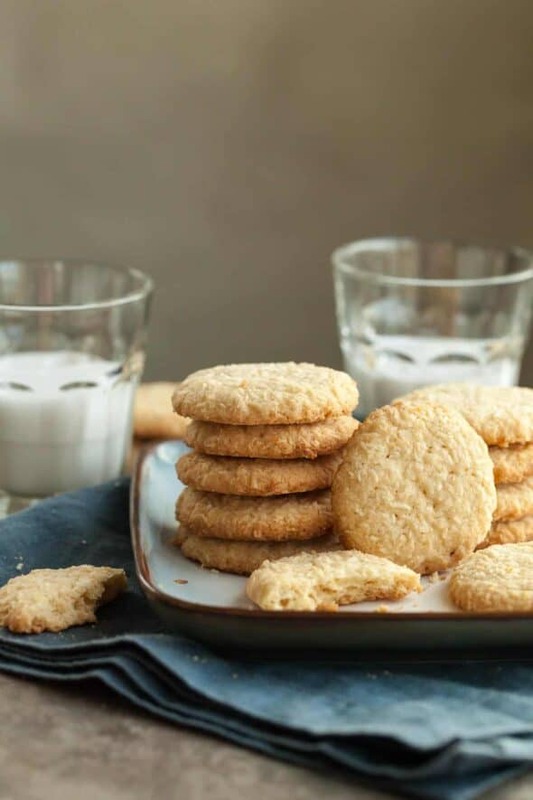 They’re an unassuming cookie, pale gold in color with flecks of coconut throughout, not the type of cookie that shouts “look at me!” but deserving of your attention nonetheless because they are ever so light and airy with a melt-in-your-mouth texture that will have you reaching for another and another. 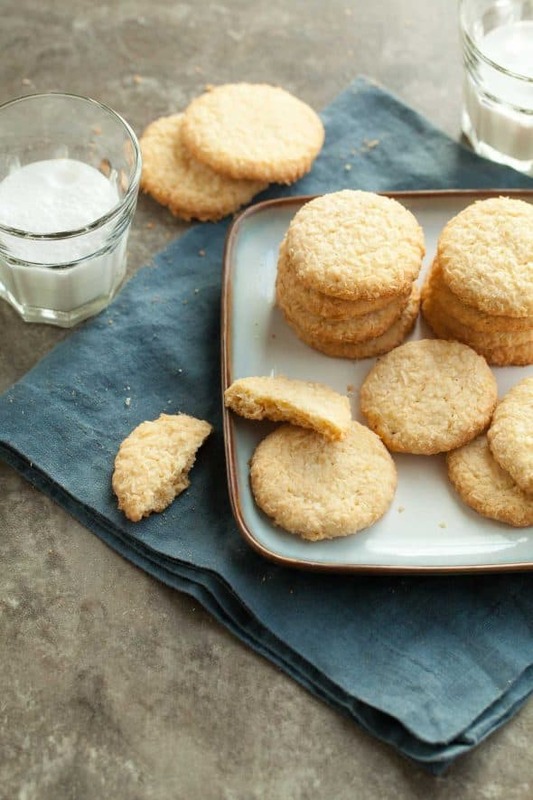 They have a sandy shortbread-like texture but with more of a crunch and less of the hassle. There’s no rolling pin, chilling or slicing involved. In fact the whole thing is pretty much a one bowl number (minus the last minute roll in coconut) so it’s a good one to get the kids involved with. It’s also rather quick, which means you can get a batch in the oven in no time when the mood strikes. 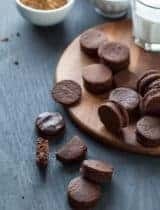 I should also mention that they pack easily and keep well for days, making them an ideal homemade gift, and since they’re gluten-free, vegan and paleo everyone on your list can enjoy them. 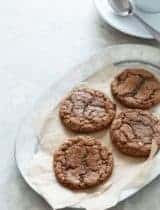 So let’s all get in the kitchen and start baking, because who doesn’t need a delicious little cookie that whips up in a flash in their life right about now? In a large bowl beat together palm shortening, vanilla, salt and maple syrup. Add almond flour, arrowroot and shredded coconut. Beat until dough comes together, and then gently form into a ball. Sprinkle more shredded coconut in a small flat dish. 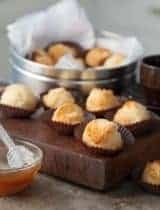 Pinch small Tablespoon sized pieces of the dough off and roll into balls in the palm of your hands (dough will be sticky), then gently roll in the shredded coconut until completely covered. Place rolled cookie dough balls on parchment lined baking sheet. 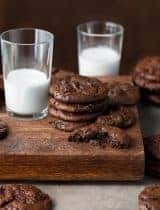 Gently press cookies with the bottom of a glass to flatten into thick disks. Bake until edges are golden, 10-13 minutes. Remove baking sheet to wire rack and let cool completely (cookies will harden and crisp as they cool). I love coconut anything! 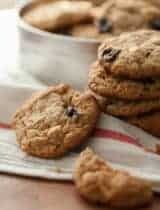 These cookies look so delicious and perfect with a cup of tea! Super impressed by the look and texture of these, and that they're egg-free. Can't wait to make for my son! Thanks! Hi! Have you ever subbed the shortening for either butter or coconut oil? I usually have both around, but don’t typically have shortening. Thanks! I would not substitute coconut oil for the shortening, butter would be better but will result in a more fragile final result. It’s hard to get a crispy paleo cookie! These look absolutely perfect in their simplicity! Yum! I can smell the toasty coconut cookies from here! 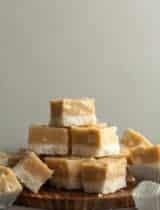 They will go so well with a cup of hot coffee or tea! I love all things coconut. These look great! These are simply beautiful... or beautifully simple -- either way! I love their light color and how they just look like slightly sweet comfort food to me. Perfect with a cup of tea! These look like something my kids will love! I'm always on the lookout for healthier treats for them - thanks! Delicious! Thank you! I didn't have any palm shortening, so I did use Kerrygold unsalted butter. I also subbed 2 tbsp of Just Like Sugar to cut the carbs a bit. Worked perfectly! 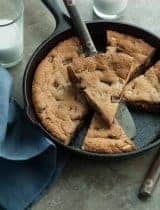 The cookies held together well and the edges were deliciously crispy. Plus both the arrowroot and the Just Like Sugar (mostly chicory root) are high in inulin, so this is a fairly healthy dessert. Thanks again!